There is just something about a nice fittin’ pair of trousers. Feeling secure, feeling snug, and feeling like you look the part are key. All of this is highlighted even more with regard to motorcycle pants. For a more enjoyable ride, it is important to find the best pair for your needs. If, by chance, your needs happen to be for long-range, all-day riding that require you to be in the saddle for long periods and through various conditions, then the new Dainese Rainsun Pants might just be the right option for you. 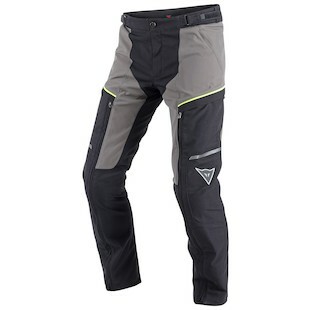 Built to take on a wide range of climatic conditions, the Rainsun Pants are a great choice for hot weather / wet riding. With the D-Dry waterproof membrane laminated directly to the outer shell, they do not require an additional internal liner to repel water. At the same time, you have the ability to completely remove a massive front textile panel that reveals the inner high-resistance mesh underneath. This allows you to turn your solid-shell pants into a highly ventilated mesh option should the weather call for increased airflow. Whether you moto in the rain, or moto in the sun, Dainese has a pair of pants that are plenty of fun!